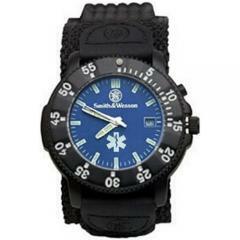 This Back Glow EMT watch from Smith & Wesson is a high-quality, high-durability timepiece for emergency responders. Its face is electronically backlit and features large luminous hands and markings as well as an EMT logo, making it easy to read in low-light conditions. Its wide black nylon wristband fastens securely and resists wear and abrasion, and the durable 40 millimeter steel casing is water-resistant to 90 feet. The watch bezel rotates, allowing you to easily keep track of elapsed time, and the Japanese quartz movement provides accurate timekeeping, with an included date counter. Happy with it works great. Transparent Palm/Cluster Lifting Tape - 3" x 360"
Transparent Polyethlene Lifting Tape - 1.5" x 360"